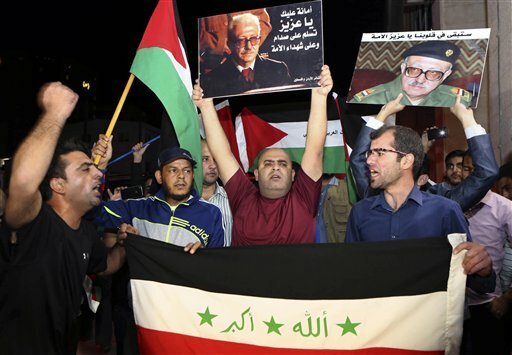 AMMAN, Jordan (AP) — Tariq Aziz was laid to rest Saturday after a ceremony in his honor at a church in the Jordanian capital, Amman, eight days after the debonair Iraqi diplomat died in prison of a heart attack. Hundreds of Iraqis and Jordanians attended the church services of Aziz, the only Christian in Saddam Hussein’s inner circle, at St. Mary of Nazareth church in Amman. “You had frightened your enemies when you were free, and you had frightened them even after your soul left your body which had suffered from the prison’s darkness,” said Aziz’s daughter, Zeinab, speaking at the ceremony. “Your message has reached everybody in the whole world,” she said. Supporters of Aziz chanted pro-Baath party and anti-Iran slogans outside the church. Supporters also carried pictures for former Iraqi president Saddam Hussein. Aziz died June 5 at age 79. He had been in prison since the U.S.-led invasion of Iraq in 2003 and suffered a series of strokes. He faced execution for his role in a government that killed hundreds of thousands of Iraqis. After the ceremony in Amman, Aziz was buried in the historical Christian town of Madaba, ending an eight-day sojourn from southern Iraq to the Baghdad airport, where his body briefly disappeared, before being flown to Jordan for burial. Jordan’s government agreed to a request by Aziz’s family to bury him in Jordan. After an autopsy, Zeinab said her father’s body went missing at Baghdad International Airport on Thursday. Authorities said Aziz’s body never went missing, but was merely delayed over incomplete paperwork. The body arrived in Amman early Saturday morning. Tags: amman, body, deputy, Iraq, middle eat, pro-baath, Saddam. Bookmark the permalink.